18th September 2016 is a date to be remembered as four heavily armed militants laid down a bloody attack upon Kashmiri border security forces in the town of Uri. 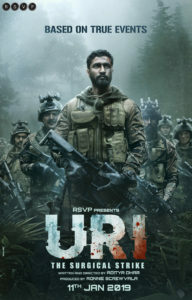 Based on those events is the film of the retaliation, Uri: The Surgical Strike. Vicky Khausal leads a unit to hit those suspected of having committed this attack with a surgical strike approach, attacking the heart of the suspected groups. There are a lot of guns and noise, there are a lot of explosions and so the music can either be an assistant to this noise or it can play as a breaker in between scenes to give the audience a chance to calm down after a particularly gory moment. Shashwat Sachdev of last years Veere di Wedding is on hand to give a short but punchy album. Challa (Main Lad Jaana) is a known, traditional cry to drive Sikh troops into battle with the additional “Main Lad Jaana”. Since it’s a traditional song it can’t really be tampered with, so the expected words and tune are held. Singers Romy and Vivek Hariharan give their all as they scream these words at the top of their ranges while in the background the almost theme sound of main lad jaana drones in ears to drive the blood and passions wild. This continues through till the end with the loudest flourish to bring the song to a close, however the mix of loud and electric and quiet and traditional make for some confusing sounds. For this reason, it certainly hits the listener but maybe not quite in the heart. At the other end of things is Behe Chala. Soft, smooth acoustics sung by Yasser Desai with acoustic guitar and a janglestick for alertness, this is about letting go of the known shores and just drifting off wherever the current takes it. This isn’t in any way a love song, unless your love is of Mother India. Yet, there is still an underlying current of persistence, of making the world work for you rather than just following. The song itself may be aiming to lull cinemagoers into sleep however as in doing all this it drags on for a long time, especially if the listener is not lulled into its cosy presence. But when you need loud, you need Daler Mehndi. Thus, he is asked to team up with Dee MC for Jagga Jiteya. Last year Raftaar gave Bollywood a new look at rap with easy to follow lyrics set to topical beats. Dee MC achieves the same in this song, interspersing her rap stylings between Daler’s choruses. This one is for the Punjabis, but both old and young. Yet at the end of the day it’s got nothing more than hyped bhangra for rhythm and beat and its Punjabi lyrics are difficult for those not of the Punjabi language. Manzar Hai Ye Naya is another song for the traveller. Shantanu Sudame gives a powerful rendition with only an acoustic guitar and a chorus. This is patriotism, this is going where others have not gone before. This is daring-do, this is Christopher Columbus. The lack of instrumentation gives an eerie sensation to whole thing but a lack of any beat being created makes it hard to find a time signature to follow. But since this one hits the heart, even these limited instruments do the job. Finally, Jigra by Siddharth Basrur. A song straight from the heart that could be used as a title song or an introduction song for the main character. The instruments that missed out in the previous song are all on show here with electric guitar, violins, jazz bass, bass drum and hi-hat all getting their moment to shine. The singer is again screaming but the audio engineers have kept him tempered to stay even with the instruments. Since there isn’t a distinctive voice this quickly becomes extremely repetitive, but it does finish with a strong drum solo enticing idea of things to come. It seems obvious when Shashwat Sachdev was given the notes for the soundtrack of this film they must have had the words ‘Go Loud’ in big marker pen on them. Some of India’s finest loud singers are on show and even then, many of them seem to be screaming. The music has been asked to be a support to the film’s story, not a break from it. To that extent there can be no complaints. Except for Behe Chala, which serves a very interesting purpose, each song drives the arrow of patriotism harder into the chest of every listener and cinemagoer. But as with a lot of these films, it’s hard to remember the songs on their own, as so very few of them resonate with the ordinary person who spends their money to watch the film and/or listen to the soundtrack.